Okuma Teas sources quality shade-grown tencha leaves from farms across the Yame region of Japan - a place that attracts tea connoisseurs from around the world. Nestled high in the mountains of southern Fukuoka, the relatively warm temperatures in the day and the cool temperatures at night allow the tencha leaves to develop a rich umami taste and a unique terroir. Okuma Teas' premium Matcha products are used throughout the globe to bring superior Matcha flavors to purveyors of fine baked goods, specialty tea beverages, and innovative health foods. Japan produces many varieties of tea from several regions, but it is known throughout the country that Yame teas are exceptional. Refined teas such as Gyukuro and Tencha are expertly cultivated in the region with ideal growing conditions as well as sophisticated, meticulous growing techniques. Okuma Matcha is made by grinding premium Tencha green tea leaves into a fine powder and consumed in its entirety. This allows antioxidants, vitamins, minerals, fibers, and chlorophyll to be consumed in higher concentration per cup. Unlike typical steeped teas, Matcha contains high amount of Insoluble Fiber. Studies show that Catechins (EGCG), also found in Matcha, lower blood sugar at a much higher rate when combined with both soluble and insoluble fibers. One pound of pure culinary grade Matcha produced by Okuma Teas in the renown Yame region, Japan. A great value for high quality bulk Matcha purchases. Overflowing with antioxidants, Okuma Matcha is a helpful tool for neutralizing cancer-causing free radicals and curbing the aging process. Contains natural caffeine in moderate amounts, making it a healthy substitute to coffee. Boosts metabolism and aids digestions with both soluble and insoluble fibers. An absolute super food. Flavorful and Versatile. 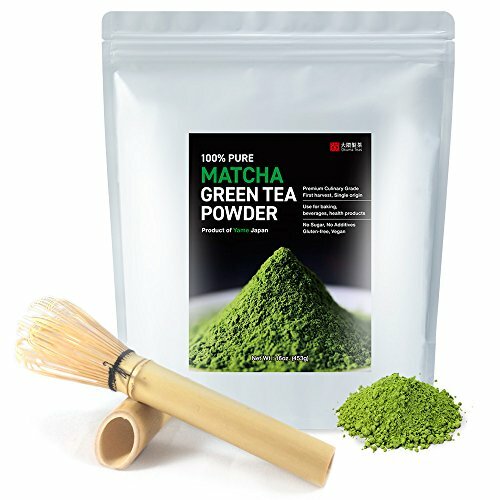 Okuma Matcha is Perfect for all Matcha needs; Matcha Lattes, energizing green smoothies, delicious and unique baked goods. Manufacturer: Okuma Tea Processing Co.,Ltd. Publisher: Okuma Tea Processing Co.,Ltd. Studio: Okuma Tea Processing Co.,Ltd. If you have any questions about this product by Okuma Teas, contact us by completing and submitting the form below. If you are looking for a specif part number, please include it with your message. © 2019 - rat-coffeeshop.com. All Rights Reserved.